Onion lights are a classic look that’s remained popular for over a century. Originally designed to hold a small flame, new onion lights can house almost any kind of light, letting you create a soft lighting look that boasts a classic and familiar design. Brass Traditions’ onion lights come in a wide range of designs and looks, but every one combines modern technology with the rustic charm of the classic onion light. They’re also available in a wide range of finishes so they can enhance your existing decor choices, or become the center piece of your outdoor space. Onion lights from Brass Traditions line are made to order and to your specifications. All of our designs are customized and made with contemporary looks in mind so that you can have a truly unique blend of old school charm and new school design. Brass Traditions lights are all designed and hand-crafted in Connecticut. The company’s been creating custom lighting solutions for over twenty years and perfected the art of quality and style. When you purchase these onion lights, you are receiving lights of the highest quality, made from solid materials and designed to enhance the look of almost any space. Rather than find an antique that may fall apart, these onion lights are sure to stand the test of time. With quality post mountings, your brand new onion lights can hang almost anywhere, including from the side of your home’s exterior and any metal or wooden posts you may have. With such versatility, you can get quality, fashionable lighting where you need it most. So if your yard has a dark spot in need of illumination, or you want to create a certain look for your patio, our onion lights will help you achieve your goals. The onion light is one of the staples of the lighting industry. Made with a bulbous glass housing that also gives these traditional lights their name, they can be hung outdoors, on patios, and almost anywhere that you want a timeless design. 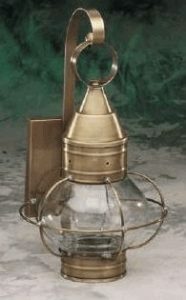 The key to getting the perfect onion light is looking for quality and Crescent Harbor’s Brass Traditions line has full range of onion style lanterns to meet your needs. If you’re in need of a classic look that’s quality made and incorporates contemporary technology and sensibilities, then Brass Traditions’ onion lights are for you.